The return of Coitus comes in the form of a celebration of the world’s most beautiful boy -Francisco Lachowski. 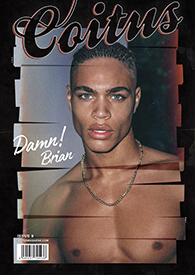 Photographed alongside a selection of our favourite boys from around the world by an array of photographers in the classic Coitus style, Issue Four is here! Limited edition of 1000 copies in total, Coitus 4 promises to be another great collector’s item. Make sure you browse our site, have a look at the new issue previews and videos and get your copy wherever in the world you are, through our online sales. Once again we would like to thank you for making Coitus such a success story and keeping an independent magazine going strong.